Our industry news section covers a broad range of news items of particular relevance to the cybersecurity industry and managed service providers (MSPs). This section also included details of the latest white papers and research studies relating to malware, ransomware, phishing and data breaches. These articles provide some insight into the general state of cybersecurity, the industries currently most heavily targeted by cybercriminals, and figures and statistics for your own reports. Hackers and scammers conduct massive spam campaigns designed to infect as many computers as possible. These attacks are random, using email addresses stolen in large data breaches such as the cyberattacks on LinkedIn, MySpace, Twitter and Yahoo. However, highly targeted attacks are increasing in frequency, with campaigns geared to specific industries. These industry-specific cyberattacks and spam and malware campaigns are detailed in this section, along with possible mitigations for reducing the risk of a successful attack. This category is therefore of relevance to organizations in the education, healthcare, and financial services industries – the most common attacked industries according to recent security reports. The articles contain information about current campaigns, spam email identifiers and details of the social engineering tactics used to fool end users and gain access to business networks. By following the advice in these articles, it may be possible to prevent similar attacks on your organization. 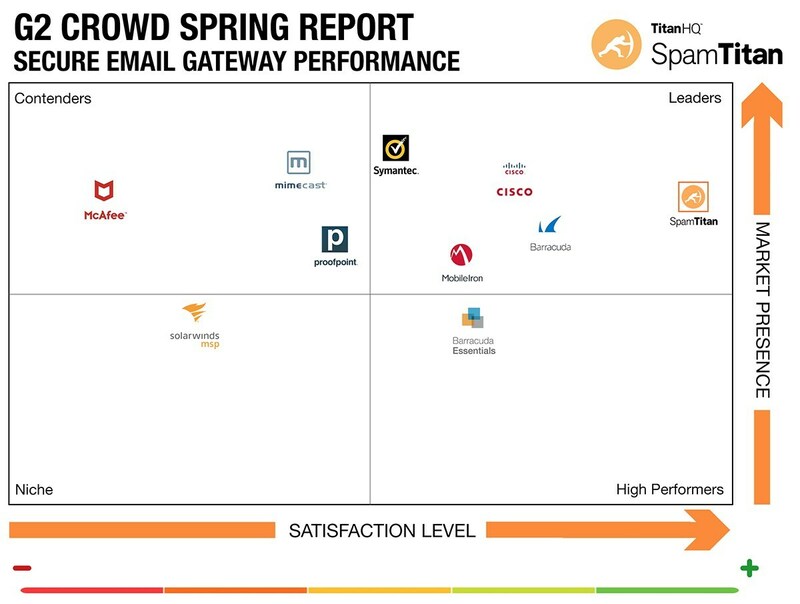 G2 Crowd, the trusted business software review platform, has recognized SpamTitan as a High Performer for email security. The solution has been praised for speed of implementation, ease of use, quality of support, and its spam filtering capabilities. Finding the right software solution can take a lot of time and effort. Even when software is carefully and painstakingly reviewed, making a purchase can be risky. G2 Crowd helps businesses find the most suitable software and services and make informed buying decisions, taking the guesswork out of software selection. The G2 Crowd platform contains more than half a million independent, authenticated reviews from users of software solutions that give honest feedback on software solutions after having put them through their paces. The platform is trusted by businesses and its user reviews are read by more than 2 million buyers every month. This December, G2 Crowd released its Winter Secure Email Gateway Grid℠, which ranked SpamTitan as the highest performer in the mid-market segment. According to G2 Crowd, “High Performers provide products that are highly rated by their users,” and have achieved consistently positive reviews from the people that matter – customers. 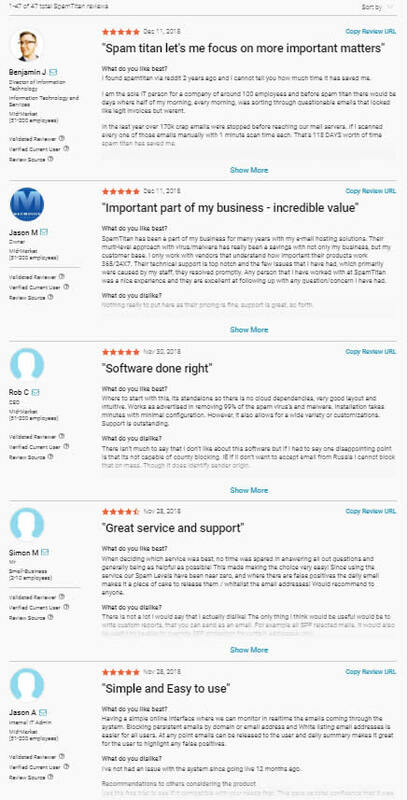 The high position is due to consistent 5-star reviews from users. 93% of user-reviewers on the site have awarded SpamTitan 5 stars out of 5, with the remaining 7% giving the solution 4 stars out of 5. SpamTitan has attracted praise across the board, notably for how easy it is to set up, use, maintain, its reporting tools, the quality of customer support, and price. SpamTitan has also been rated as a 5-star email security solution by users of Spiceworks and has won more than 37 consecutive Virus Bulletin Spam awards. Not only is SpamTitan an ideal solution for SMBs to block spam email, malware, and phishing threats, it has been developed to also meet the needs of managed services providers to allow them to easily add spam filtering and phishing protection to their service stacks. SpamTitan is available with three deployment choices: SpamTitan Gateway, SpamTitan Cloud, and SpamTitan Private Cloud, to meet the needs of all businesses. 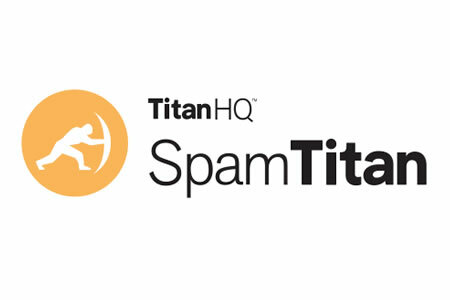 Check out the SpamTitan reviews on G2 Crowd and contact TitanHQ to schedule a product demonstration. SpamTitan is also available on a free 14-day trial to allow you to test the solution for yourself in your own environment. The UK Government’s Department for Digital, Culture, Media, & Sport has published its Cybersecurity Breaches Survey for 2018. The survey, conducted by Ipsos MORI, was a quantitative and qualitative survey conducted in the winter of 2017 on 1,519 UK businesses and 569 UK registered charities. The purpose of the cybersecurity breaches survey was to identify the nature and significance of cyberthreats, determine how prevalent cyberattacks are, and what is being done to prevent such attacks. The cybersecurity breaches survey revealed UK businesses and charities are being targeted by cybercriminals intent on gaining access to sensitive information, email accounts, corporate networks, and bank accounts and attacks are on the rise. 43% of businesses and 19% of charities experienced a cybersecurity breach or cyberattack in the past 12 months with large businesses and charities more likely to be attacked. 72% of large businesses – those with more than 250 employees – and 73% of large charities – with incomes over £5 million – experienced a cyberattack in the past year. While not all security breaches result in material losses such as theft of data or personal information, when there is a material outcome the costs can be significant. The average costs of breaches with a material outcome is £3,100 for businesses and £1,030 for charities, although the larger the business, the greater the cost. Medium sized businesses have average costs of £16,100 and large businesses have an average breach cost of £22,300. 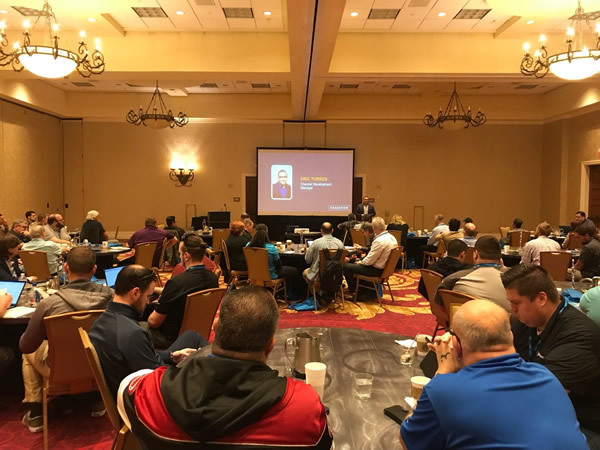 The high probability of a breach occurring and the high cost of remediating breaches has seen cybersecurity become a priority for senior managers. The percentage of businesses (74%) and charities (53%) that say cybersecurity is a high priority has risen year on year and the percentage of businesses (30%) and charities (24%) that say cybersecurity is a low priority has fallen once again. Cybersecurity is also now a high priority for many small businesses (42%) having risen from 33% last year when the survey was conducted. Cybersecurity may be a high priority, but just 3 out of 10 businesses and under a quarter of charities have board members with a responsibility for cybersecurity. The most common type of breaches and cyberattacks involve fraudulent emails directing employees to malicious websites. 75% of UK businesses and 74% of UK charities that experienced a breach in the past year experienced these types of attacks. Email impersonation attacks were the second most common breach type with 28% of UK businesses and 27% of UK charities saying they had experienced these types of incidents in the past 12 months. Not only are these types of attacks common, they also cause the most disruption. 48% of UK businesses and charities said fraudulent emails and being directed to malicious websites caused the most disruption out of all cybersecurity breaches experienced, well ahead of malware infections which were rated as the most disruptive cyberattacks by 13% of UK businesses and 12% of UK charities. The cybersecurity breaches survey clearly highlights the importance of implementing robust defenses to prevent malicious emails from being delivered to employees’ inboxes and to ensure staff are well trained and taught how to identify malicious emails. 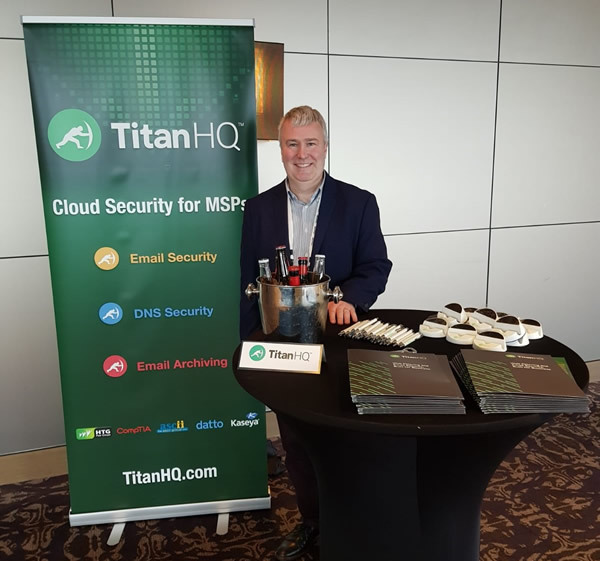 TitanHQ offers two cybersecurity solutions that can help UK businesses block the most common and most disruptive types of cyberattack. SpamTitan is a powerful spam filtering solution that blocks more than 99.97% of spam emails and 100% of known malware from being delivered to end users’ inboxes. WebTitan is a cloud-based web filtering solution that prevents employees from visiting malicious websites, such as those used in phishing emails to steal credentials and spread malware. Implementing these solutions is far cheaper than having to cover the cost of remediating cyberattacks. There is also clearly a problem with training in the UK. Only 20% of UK businesses and 15% of UK charities have had staff attend internal or external cybersecurity training in the past year, even though security awareness training has clearly been shown to be effective at reducing susceptibility to email-based attacks. A new report has been released that shows there has been a massive rise in the global cost of cybercrime, highlighting the seriousness of the threat from hackers and scammers. 2017 global cybercrime costs exceeded $600 billion, according to the McAfee report. That represents a 20% increase since 2014, when the global cybercrime costs were calculated to be around $500 billion. The current global cybercrime costs equate to 0.8% of global GDP. The report shows that in spite of increases in cybersecurity spending, hackers and scammers are still managing to breach organizations’ defenses and gain access to sensitive data, login credentials, corporate bank accounts, and intellectual property. Any calculation of global cybercrime costs involves some margin of error, as the figures cannot be totally based on reported losses by businesses. Many companies do not disclose details of data breaches, and even fewer publish information of the financial impact of cyberattacks. When details about financial losses are published, typically only a fraction of the losses are reported. In many cases the losses are not known until many years after the event. It is therefore difficult to obtain a true picture of the losses due to cybercrime because of the shortage of data. To try to gain an accurate picture of the total cost of cybercrime, McAfee had to turn to the same modelling techniques used by government agencies to determine the costs of criminal activities such as drug trafficking, prostitution, maritime piracy, and organizational crime groups. McAfee is not the only company to make these predictions. Compared to some reports the figures from McAfee seem quite conservative. The true cost could be considerably higher. McAfee reports that several factors have contributed to the large increase in cybercrime costs over the past few years. The growth in popularity of ransomware has played a part. Ransomware has proved to be a particularly plump cash cow, allowing cybercriminals to rake in millions by extorting companies. The anonymity of cryptocurrencies has helped these cybercriminal gangs obtain payments without detection, while the use of TOR has helped the gangs stay under the radar of law enforcement agencies. Ransomware-as-a-service has also boosted profits for cybercriminals. The increase in the number of individuals conducting attacks has made it possible to increase the scale of operations and distribute the malicious code more effectively. State-sponsored hacks have also increased, including attacks aimed at sabotaging businesses and critical infrastructure as well as major heists that have seen millions of dollars stolen. McAfee cites research showing around 300,000 new malware samples are now being identified on a daily basis, while data breaches are exposing a staggering 780,000 records a day. Personal records can sell for big bucks on darknet forums; however, one of the biggest costs is the theft of intellectual property, which McAfee estimates has resulted in at least 25% of the annual losses to cybercrime. When patented processes are obtained, the benefits of millions in research and development is lost and companies can lose their competitive advantage. One thing is clear from the report. With global cybercrime costs rising, and the sophistication and frequency of attacks increasing, companies have little alternative than to invest more in cybersecurity and develop more sophisticated defenses. Last week news broke that government supercomputers in Russia had been turned into cryptocurrency miners, now comes news that many UK government websites have been infected with cryptocurrency mining code. The latest attack affects government websites around the globe, with more than 4,200 websites turning visitors’ computers into cryptocurrency miners. The attack involved a popular website plugin called Browsealoud. Browsealoud is used to convert written website content into audio for the blind and partially sighted. The browser plugin was compromised by hackers who altered the source code of the plugin to include cryptocurrency mining code. By altering the plugin, the malicious code runs every time a site user visits a webpage that offers the audio function using the Browsealoud plugin. When a visitor arrived at such as webpage, the code ran and turned that user’s computer into a cryptocurrency miner, using the computer’s processing power to mine Monero. Mining is the term given to verifying cryptocurrency transfers. Mining requires a computer to solve a complex problem. Once that problem is solved, the miner is rewarded with a small payment. In this case, the individual(s) who altered the code. Using one computer to mine cryptocurrency will only generate a small return. However, by hijacking a browser plugin on a website that is visited by many thousands of individuals, the potential returns are considerable. The processing power of millions of computers can be harnessed. Browsealoud was developed by the British company Texthelp. According to its website, its plugin has been installed on 4,275 domains. In the United Kingdom, many government websites use the plugin, including the Financial Ombudsman Service, the Information Commissioner’s Office, the Student Loans Company, many National Health Service (NHS) websites, and local government websites including the .gov.uk sites used by Camden, Croydon, Manchester, and Newham to name but a few. Many federal and state government websites in the US have turned their visitors’ devices into cryptocurrency miners, and it is the same story in Australia, Ireland, Sweden, and beyond. The Browsealoud plugin is understood to have been infected with cryptocurrency mining code at some point between 0300 and 1145 UTC on February 11, 2018. The code was only active for a few hours before the change was identified and Texthelp disabled the plugin. The mining only took place while a visitor was on a webpage that used the Browsealoud plugin. As soon as the tab or browser was closed, the mining stopped. Visiting the website that had been infected with cryptocurrency mining code via the plugin would not result in a malware infection. The only noticeable effect for any visitors to the websites would have been a slowing down of their computers or the fan starting as their computer started going into overdrive. This incident has however made it quite clear to government agencies that their websites are not secure and using third party plugins on their sites to improve services for website users introduces risk. These supply-chain attacks exploit a trusted relationship between the website owner and a third-party software/plugin supplier and the benefits for cybercriminals are clear. All it takes is for one plugin to be hacked to have malicious code run on many thousands of websites, thus targeting millions of website visitors. In this case, the damage caused was minimal, but the attack could have been much worse. The goal on this occasion was to mine cryptocurrency. The attackers could easily have inserted much more malicious code and attempted to steal login credentials. That means a new hash is required if the vendor does not include a version number in their updated code. However, it will ensure that attacks such as this, or worse attacks with much more malicious code, will be blocked. It has been pretty difficult to avoid the news of Meltdown and Spectre – Two vulnerabilities recently discovered that could potentially be exploited to gain access to sensitive information on PCs, Macs, servers, and smartphones. Meltdown and Spectre affect virtually all devices that contain CPUs, which amounts to billions of devices worldwide. Meltdown and Spectre are two separate vulnerabilities affecting CPUs – central processing units. The chips that power a wide range of electronic devices. The flaws make devices vulnerable to side-channel attacks, in which it is possible to extract information from instructions that have been run on CPUs, using the CPU cache as a side channel. There are three types of attacks, two for Spectre and one for Meltdown. Spectre Variant 1 – tracked as CVE-2017-5753- is a bounds check bypass, while Spectre variant 2 – tracked as CVE-2017-5715 – is a branch target injection. Variant 3, termed Meltdown – tracked as CVE-2017-5754 – is a rogue data cache load, memory access permission check that is performed after kernel memory read. The less technical explanation is the attacks leverage the prediction capabilities of the CPU. The CPU will predict processes, load them to an easily accessible, fast sector of the memory to save time and ensure fast performance. Spectre allows data to be read from the memory, but also for information to be loaded into the memory and read that would otherwise not be possible. Meltdown also reads information from the memory, stealing information from memory used by the kernel that would not normally be possible. What Devices are Affected by Meltdown and Spectre? US-CERT has warned that the following vendors have been affected by Meltdown and Spectre: AMD, Apple, Arm, Google, Intel, Linux Kernel, Microsoft, and Mozilla. Apple has said that virtually all of its Macs, iPhones, and iPads are affected. PCs and laptops with Intel, Arm, and AMD chips are affected by Spectre, as are Android smartphones. while Meltdown affects desktops, laptops, and servers with Intel chips. Since servers are affected, that has major implications for cloud service providers. How Serious are Meltdown and Spectre? How serious are Meltdown and Spectre? Serious enough for the Intel chief executive officer, Brian Krzanich, to sell $25 million of his shares in the company prior to the announcement of the flaws, although he maintains there was no impropriety and the sale of the shares was unrelated to the announcement of the flaws a little over a month later. For users of virtually all devices that contain CPUs, the flaws are certainly serious. They could potentially be exploited by malicious actors to gain access to highly sensitive data stored in the memory, which can include passwords and credit card data. What makes these flaws especially serious is the number of devices that are affected – billions of devices. Since one of the flaws affects the hardware itself, which cannot be easily corrected without a redesign of the chips, resolving the problem will take a considerable amount of time. Some security experts have predicted it could take decades before the flaws are totally eradicated. At present, it would appear that the flaws have not been exploited in the wild, although now the news has broken, there will certainly be no shortage of individuals attempting to exploit the flaws. Whether they are able to do so remains to be seen. What Can You do to Prevent Meltdown and Spectre Attacks? As is the case when any vulnerability is identified, protecting against Meltdown and Spectre requires patches to be applied. All software should be updated to the latest versions, including operating systems, software packages, and browsers. Keeping your systems 100% up to date is the best protection against these and other attacks. Some third-party antivirus software will prevent Windows patches from being installed, so before Windows can be updated, antivirus must be updated. Ensure that your AV program is kept up to date, and if you have automatic updates configured for Windows, as soon as your system is ready for the update it will be installed. Chrome and Firefox have already been updated, Microsoft will be rolling out a patch for Windows 10 on Thursday, and over the next few days, updates will be released for Windows 7 and 8. Apple has already updated MacOS version 10.13.2, with earlier versions due to receive an update soon. Google has already issued updates for Android phones, although only Google devices have so far been updated, with other manufactures due to roll out the updates shortly. Google has already updates its Cloud Platform, and Amazon Web Services has also reportedly been updated. Linux updates will also be issued shortly. Fixes for Meltdown are easier to implement, while Spectre will be harder as true mitigations would require major changes to the way the chips work. It is unlikely, certainly in the short term, for Intel to attempt that. Instead, mitigations will focus on how programs interact with the CPUs. As US-CERT has warned, “[The] Underlying vulnerability is caused by CPU architecture design choices. Fully removing the vulnerability requires replacing vulnerable CPU hardware,” although that advice is no longer detailed in its updated vulnerability warning. Applying patches will help to keep computers protected, but that may come at a cost. For example, the fix for the Meltdown vulnerability changes the way the computer works, which means the processor will have to work harder as it has to repeatedly access information from the memory – tasks that would otherwise not normally need to be performed. That will undoubtedly have an impact on the performance of the machine. How much of a dip in performance can be expected? Some experts predict the changes could slow computers down by as much as 30%, which would certainly be noticed at times when processor activity is particularly high. A recently discovered Forever 21 POS malware attack has seen customers’ credit card data compromised. While malware attacks on retail POS systems are now commonplace, in the case of the Forever 21 POS malware attack, the security breach stands out due to the length of time malware was present on its systems. Attackers first gained access to its POS system seven months before the infection was discovered. The Forever 21 POS malware infections were first identified in October, when a third-party linked credit card fraud to customers who had previously visited Forever 21 stores. The potential malware infections were investigated and a third-party cybersecurity firm was called in to assist. Forever 21 first made the announcement about a data breach in November, although the investigation has been ongoing and now new details about the attack have been released. The investigation has revealed the attack was extensive and affected many POS devices used in its U.S. stores. The Forever 21 POS malware attack started on April 3, 2017, with further devices compromised over the following 7 months until action was taken to secure its systems on November 18, 2017. Forever 21 reports that some POS devices in its stores were only compromised for a few days, others for a few weeks, while some were compromised for the entire timeframe. In response to the increased threat of cyberattacks on retailers, Forever 21 started using encryption technology on its payment processing systems in 2015; however, the investigation revealed the encryption technology was not always active. While the encryption technology was active, the attackers would have been prevented from obtaining the credit card details of its customers, although the information could be stolen at times when the encryption technology was turned off. Further, some devices that were compromised by the malware maintained logs of completed credit card transactions. When the encryption technology was not active, details of completed transactions were stored in the logs and could therefore be read by the attackers. Since those logs contained details of transactions prior to the malware infections, it is possible that customers who visited affected Forever 21 stores prior to April 3, 2017 may also have had their credit card details stolen. Each store uses multiple POS devices to take payments from consumers, and in most cases only one device per store was compromised. The attackers concentrated their efforts on stores where POS devices did not have encryption enabled. Further, the attackers main aim appeared to be to find and infect devices that maintained logs of transactions. On most POS devices, the attackers searched for track data read from payment cards, and in most cases, while the number, expiry date and CVV code was obtained, the name of the card holder was not. The investigation into the Forever 21 POS malware attack is ongoing, and at present it is unclear exactly how many of the company’s 700+ stores have been affected, how many devices were infected, and how many customers have had their credit and debit card details stolen. However, it is fair to assume that an attack of this duration will have affected many thousands of customers. The type of malware used in the attack is not known, and no reports have been released that indicate how the attackers gained access to its systems. It is not yet known if stores outside the US have been affected. Digimine malware is a new threat that was first identified from a campaign in South Korea; however, the attacks have now gone global. Ransomware is still a popular tool that allows cybercriminals to earn a quick payout, but raised awareness of the threat means more companies are taking precautions. Ransomware defenses are being improved and frequent backups are made to ensure files can be recovered without paying the ransom. Not only is it now much harder to infect systems with ransomware, rapid detection means large-scale attacks on companies are prevented. It’s harder to get a big payday and the ability to restore files from backups mean fewer organizations are paying up. The surge in popularity of cryptocurrency, and its meteoric rise in value, have presented cybercriminals with another lucrative opportunity. Rather than spread ransomware, they are developing and distributing cryptocurrency miners. By infecting a computer with a cryptocurrency miner, attackers do not need to rely on a victim paying a ransom. Rather than locking devices and encrypting files, malware is installed that starts mining (creating) the cryptocurrency Monero, an alternative to Bitcoin. Mining cryptocurrency is the verification of cryptocurrency transactions for digital exchanges, which involves using computers to solve complex numeric problems. For verifying transactions, cryptocurrency miners are rewarded with coins, but cryptocurrency mining requires a great deal of processing power. To make it profitable, it must be performed on an industrial scale. The processing power of hundreds of thousands of devices would make the operation highly profitable for cybercriminals, a fact that has certainly not been lost on the creators of Digimine malware. Infection with Digimine malware will see the victim’s device slowed, as its processing power is being taken up mining Monero. However, that is not all. The campaign spreading this malware variant works via Facebook Messenger, and infection can see the victim’s contacts targeted, and could potentially result in the victim’s Facebook account being hijacked. The Digimine malware campaign is being spread through the Desktop version of Facebook Messenger, via Google Chrome rather than the mobile app. Once a victim is infected, if their Facebook account is set to login automatically, the malware will send links to the victim’s contact list. Clicking those links will result in a download of the malware, the generation of more messages to contacts and more infections, building up an army of hijacked devices for mining Monero. Infections were first identified in South Korea; however, they have now spread throughout east and south-east Asia, and beyond to Vietnam, Thailand, Philippines, Azerbaijan, Ukraine, and Venezuela, according to Trend Micro. A similar campaign has also been detected by FortiGuard Labs. That campaign is being conducted by the actors behind the ransomware VenusLocker, who have similarly switched to Monero mining malware. That campaign also started in South Korea and is spreading rapidly. Rather than use Facebook Messenger, the VenusLocker gang is using phishing emails. Phishing emails for this campaign contain infected email attachments that download the miner. One of the emails claims the victim’s credentials have been accidentally exposed in a data breach, with the attachment containing details of the attack and instructions to follow to mitigate risk. These attacks appear to mark a new trend and as ransomware defenses continue to improve, it is likely that even more gangs will change tactics and switch to cryptocurrency mining. A Q3 malware threat report from McAfee charts the continued rise in malware threats throughout the year. Malware variants have now reached an all time high, with the volume of threats having risen each quarter in 2017. In 2016, there were high levels of malware in Q1, rising slightly in Q2 before tailing off in Q3 and A4. That trend has not been seen this year. The malware threat report shows Q1 figures were higher than the previous two quarters, with a massive rise in Q3 and a continued increase in Q3. Malware threats rose 10% quarter over quarter, rising to a quarterly total of 57.6 million new samples of malware: The highest quarterly total detected by McAfee. That averages out at a new malware sample detected every quarter of a second! The ransomware epidemic has also got worse in Q3, with new ransomware variants increasing by 36% last quarter, fueled by a sharp increase in Android screen lockers. In total, new mobile malware variants increased by 60% in Q3. In its Q3 Malware Threat Report, McAfee noted that attackers were continuing to rely on spam email to distribute malware, with the Gamut botnet the most prevalent spamming botnet in Q3, closely followed by the Necurs botnet. The latter was used to spread ransomware variants such as Locky. Mac malware rose by 7% in Q3, and macro malware increased by 8%. Vulnerabilities in software and operating systems were also extensively exploited, even though patches to address those vulnerabilities were released promptly. McAfee notes that employees and organizations are making it far too easy for attackers. Employees are responding to phishing emails, are visiting malicious links and are opening attachments and enabling the content. Employers are no better. Patches are released, yet they are not being applied promptly, opening the door to attackers. In many cases, patches have still not been applied several months after they have been released. One of the most commonly exploited vulnerabilities in Q3, 2017 was CVE-2017-0199 which affected WordPad and Microsoft Office. An exploit for the vulnerability was made available through GitHub, making remote code execution attacks easy; provided employees could be convinced to open specially crafted files. Many employees fell for the scam emails. The McAfee Q3 Malware Threat Report highlighted several continuing malware trends, including the increase in the use of fileless malware. PowerShell malware increased by 119% in Q3 alone. Q3 saw a new Locky variant released – Lukitus. Lukitus was spread via spam email, with more than 23 million messages delivered in the first 24 hours since its release. That, combined with other new ransomware threats, have contributed to a 44% increase in ransomware samples in the past 12 months. Q3 also saw the release of a new variant of the Trickbot Trojan, which incorporated the EternalBlue exploit that was also used in the WannaCry and NotPetya attacks. While no industry is immune to attack, it is the healthcare and public sectors that are taking the brunt of the attacks, accounting for 40% of all reported security incidents in Q3. In the United States, healthcare was the most commonly attacked industry. The extensive use of spam and phishing emails to spread malware highlights the importance of using an advanced spam filtering solution such as SpamTitan, especially considering how employees are still struggling to identify malicious emails. Blocking these threats and preventing malicious messages from being delivered will help organizations prevent costly data breaches. The high level of infections that occurred as a result of exploited vulnerabilities also shows how important it is to apply patches promptly. McAfee notes that many of the exploited vulnerabilities in Q3 were patched as early as January. If patches are not applied promptly, they will be exploited by cybercriminals to install malware.